Betty Crocker Salted Caramel Brownie Mix Review – Create, Make & Bake! We were asked to review some Betty Crocker cake mixes, so we did. We were sent Salted Caramel Brownies, Velvety Vanilla Cake, Fudge Brownies and Chocolate Chip Cookies. 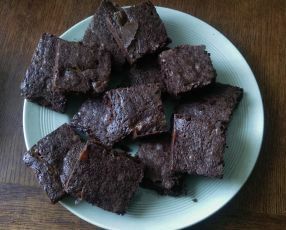 Yesterday I made the Salted Caramel Brownies so that’s what we’ll be reviewing today. Simple is an understatement when it come to these mixes. I don’t think the Salted Caramel was overly good, so its a good thing you could barley taste it in the finished product. The brownie itself was nice but I think everyone agrees that our homemade ones are better. I spent I don’t know how long working out prices, but I’ve got them now, £2.19 to make the same amount (including homemade caramel) homemade. But, including the extra ingredients it tells you to add, the Betty Crocker totals £3-£3.10 (depending on what supermarket you get it from).